Sony PS3 claims to be able to play DVD on it, but for DVD collectors, there might be a bad news for DVDs are subject to scratch and more of a worse to damage due to in and out the PS3’s DVD drive time and time again. So tons of people are looking for methods to rip DVD to PS3 recognized video formats like MPEG4, H264, etc, so that they can load up PlayStation3 with not only games but also movies. Actually, this task can be accomplished as long as you have right DVD to PS3 converter software. But one thing here I have to mention commercial DVDs are generally encrypted either by CSS or Disney Copy Protection, making DVD ripping nowadays constitutes something of a bother. But if you happen to read this article, you’re a lucky dog for in this article I will recommend a powerful program to rip both homemade DVDs and copy-protected DVD to PS3 MPEG4 with a wink. MacX DVD Ripper Pro can rip DVD to PS3 recognized videos such as MPEG4, H264, AVI, WMV2 fit for PlayStation3 with utmost video quality, regardless of DVD copy protections such as CSS, RCE, UOPs, Sony ARccOS DVD protection, Disney X—project DRM, etc. Furthermore, it continuously upgrades to offer you up-to-date DVD backup solution, making it a top contender and worthy of consideration by any DVD to PS3 converter buyers. Below are the detailed steps of ripping DVD to PS3 on Mac with a few mouse clicks. This DVD to PS3 conversion will be done in good quality and high speed using the best DVD ripper for Mac (macOS Sierra/El Capitan etc.) and for Windows (Windows version also supports win 10). Just pop a DVD in your drive, fire up this DVD to PS3 Converter after free download it on Mac(El Capitan incl.) or Windows(Win 10 incl. ), click "DVD Disc" button to import the DVD you want to rip. Alternatively, you can hit "DVD Path" button to import your files. Now that you want to decrypt and copy DVD to PS3, you can go to "Output Profile" drop-down menu to pick up PlayStation3 video accepted format, for example, convert DVD to MP4 for playback on your console. 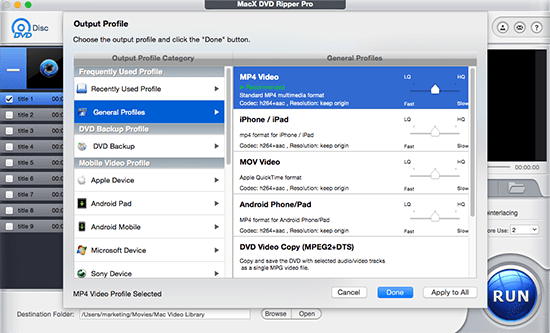 Tips: MacX DVD Ripper Pro is not limited to rip DVD movies for playback on PS3 but supports lots of different formats and tools. If you want to rip movie off the DVD for iPad, iPhone, mobile phones, Android tablets and similar portable devices, this software is the best one. Click the "RUN" button to rip DVD to PS3 on Mac. You can view the whole progress and are able to cancel it at anytime. By the way, this DVD ripper for PS3 installs like a charm and works magically. Its user interface is really very easy and even If you are a new user of Mac, you can understand and use it to rip DVD to PS3 easily. For those who’d like to put DVD to PS3 on PC, you can download Windows version PS3 DVD ripper on PC. If you want to digitize DVD to iPhone iPad etc. download free iTunes alternative, MacX MediaTrans to sync converted DVD movie file from Mac/PC to iOS devices quickly in a click, iOS 10 iPhone 7/SE are also supported. It can transfer video from iPhone to Mac, and many other media file to Mac/PC as a backup or for other usage as well. Notice: We only advocates using this best DVD ripper to rip commercial DVDs to PS3 under the concept of Fair Use and does not encourage any illegal reproduction or distribution of copyrighted content. Please abide by the local DVD copyright law before doing it. Find the best PS4 video formats, along with codecs, file extensions, etc when you want to play MP4 MKV on PS4 with no video format issues. Plus, you are informed of the ultimate solution to convert all media files to PS4 supported video/audio formats.